How Much Carbohydrate Is Right for You? Each low-carb diet recommends a different level of carbohydrate reduction. In order to get the benefits of cutting back on carbs, which is the best approach? It certainly is puzzling when you are trying to find the best way to eat. The fact is that there is no one carb level that will be best for everyone. Different low-carb diet authors discuss metabolic resistance, sugar sensitivity, or carbohydrate tolerance. They are all essentially the same thing: each person's body has a different ability to handle carbohydrate, and the trick is to figure out what is best for your body. Most of the reduced-carb diets try to address this issue by offering ways to better individually customize the diet. The goal of a low-carb diet is to find the highest carb level where you will lose or maintain weight and not have cravings which will drive you to overeat. These cravings are a very important marker, and almost every low-carb diet book talks about it. One of the most striking features of low-carb diets is that people no longer find themselves wanting to randomly munch. Being free of those urges is so liberating that it turns people into devoted followers of carb reduction. Other positive signs of eating the correct carb level are increased energy and mental alertness. People who have diabetes or prediabetes can and should monitor how their diet is affecting their blood glucose, and strive for the best blood sugar control that they can achieve. Atkins calls the point at which a person can eat the most carbohydrate while still losing weight and getting the other benefits of the diet their "Critical Carbohydrate Level for Losing" (CCLL). Arthur Agatston of the "South Beach Diet" doesn’t have a name for it, but he recommends that dieters in Phase 2 of his plan gradually raise their carbohydrate level until they experience cravings, and then back down. Atkins and Agatston both require a highly restricted initial phase of their diets. It is this phase that has drawn the most criticism. It is legitimate to ask whether it is necessary to cut carbs this much, even for a short time. Others, notably the American Diabetes Association, recommend cutting back more gradually on carbohydrate to find the best amount. There are pros and cons to each approach. Is this an art dependent on individual customization than a science? People who are sensitive to carbohydrates are on a continuum. Some will benefit from small reductions in carbohydrates, while others need a larger reduction to experience the benefits. If everyone goes on a slightly carb-reduced diet, a small percentage will reap the benefits. If everyone goes on a highly restricted diet, they will almost all get the benefits of carb restriction, but they may also have some negative effects from the diet itself, especially in the first week. The trick is to find a way to help each person zero in on the best level of carb intake for them. Finding the highest carb level where the benefits can be achieved is a good goal. But is cutting back severely at first the best way? The severe cutback in carbs in an initiation phase is probably is the best way for some people. But it seems likely that most people can still receive the benefits by starting at a higher carb level and avoiding some of the problems. While Atkins starts people at 20 grams of daily carbohydrate, Michael and Mary Eades of "Protein Power" say 30 grams, Diana Schwarzbein of "The Schwarzbein Principle" says at least 60, the Zone diet says 100 to 150, and "Sugar Busters" would probably be around 140 to 200 grams. All of these are considerably under standard nutritional advice, which is generally around 250 to 300 grams of carbohydrate daily (depending upon calories and other factors). People on all these plans say essentially the same thing about the positive effects—decreased cravings, increased energy, etc. You may want to start a little higher than Atkins recommends. At 20 grams of carbohydrate per day, a significant number of people experience negative effects. It is also difficult to get the full range of nutrients on 20 grams of carbs per day. When you raise the carb allowance to 30 or, better yet, 40 grams per day, it becomes much easier to create fully nutritious meal plans. At higher carb levels you will be able to eat a greater variety of foods and avoid getting bored. You can then increase from that point, just as Atkins and Agatston suggest. If you have carb cravings or weight gain, it is a sign to back down to a lower level of carbohydrate which will give the maximal benefit for the least discomfort. That produces a way of eating that people can live with rather than a crash diet. Which Carbs to Add First? When adding carbs, is it better to add a piece of bread or an apple? Both Atkins and Agatston have different recommendations about adding carbs. Each person responds differently to different foods. 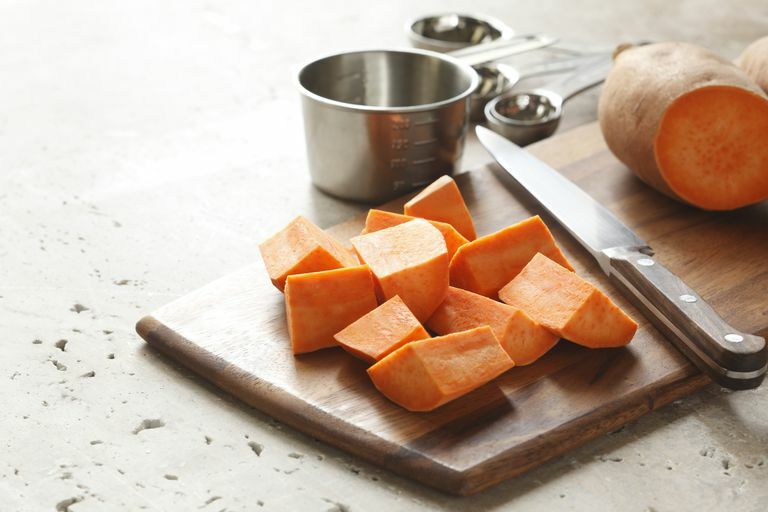 Some might do better with starches, for example, a small sweet potato, whereas fruit works better for others. As always, let your own body's responses be your guide.